April 30, 2014 - "Company News"
Coxreels introduces the all-new 1600 Series hand crank and motorized hose reels. This feature-rich reel has a wide array of components configurations and many possible sizes to choose from providing a robust reeling platform for any conceivable application and making it the most versatile design available on the market today. The 1600 Series offers a generous variety of drum and disc size combinations for many dimensions and hose length capacities and is currently available in 1” and 1-1/2” NPT, BSP or NST nickel plated swivel inlets. 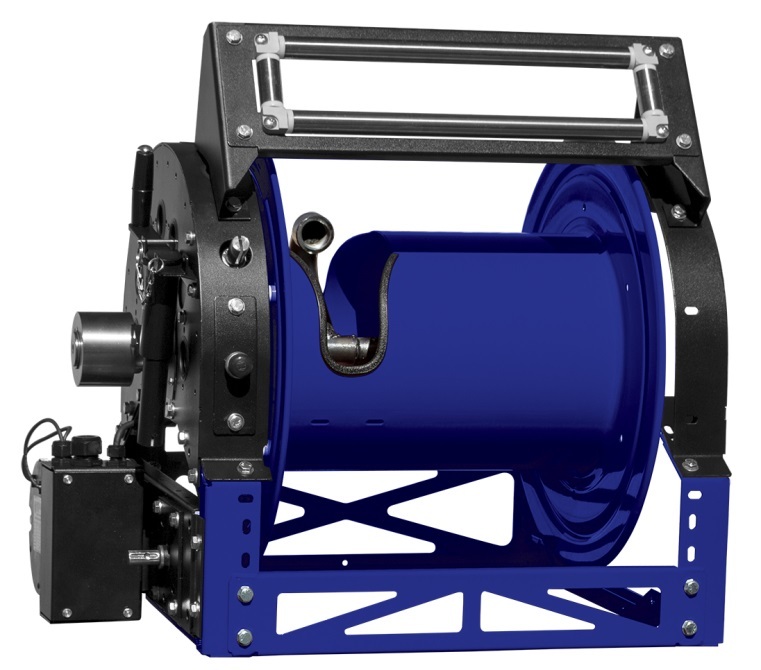 The foot print of the reel was designed to meet the most demanding requirements in the industry and fit any allocated space in virtually all equipment. Extensive engineering has gone into the creation of the 1600 Series, as a result; this new reel features great original add-ons and a unique all welded “hybrid” frame with the strength of an “A” frame mounted on a box frame for superior reel structure. Some of these new options include an universal bracket kit to accommodate the bevel gear rewind system and hose guide rollers at various angles and three gear ratio idler gears to reduce speed and increase torque on motorized versions. Another uniquely available feature is that of a patent pending 3-way industrial duty pin lock that can rewind, lock and disengage the reel for free unwind. Coxreels is also pleased to provide our first 3-way brake with lock, drag friction and free spinning positions featuring high performance composite brake pad material. Many more options, add-ons and accessories are available on the 1600 Series for professionals who want to tailor and build the ultimate reel solution that will suit the most demanding needs. supporting all of their products right here in the U.S.A.